Home > Shop By Brand > BLACKFIRE Pro Detailers Choice Car Care Products > BLACKFIRE Synthetic Spray Wax 32 oz. Amazing product and Easy to Use!!! Got a Free Sample Bottle with a purchase and been in love since. I use it on my 2015 Ruby Red Mustang after every wash. I use Wolfgang Deep Gloss Spritz Sealant and McKees MaxWax once a year in the spring and use this Spray Wax after every wash for the rest of the season. Its amazing!! Shine is great and it prolongs the protection of my sealant and wax! ProsVery easy to use. One spray will spread far and wipes and buffs off very easy. Been looking for an awsome product that can be put on entire truck - paint,glass,plastic,wheels, etc, etc. This is it. If u like Turtle Wax Ice products for thier convenience, this is just as easy to use with much better results, and higher quality. Great shine, quick and easy to use. I received this in a sample size with a recent order and really liked it. It was easy to use, I liked the smell, and it left a great shine on the car. I think they should just call it a spray sealant, but maybe "Synthetic Spray Wax" is more familiar to people. Only drawback: The bottle is one of those big squared off ones, that is not comfortable to hold. Why not shape the bottle a little more ergonomically, like the Meguiar's spray bottles? ProsShine, smell, ease of use. It's a great product. ConsI do not care for the spray bottle. It's 32oz, so it's a good value, but that makes it a little heavy, and the bottle is not comfortable to hold. 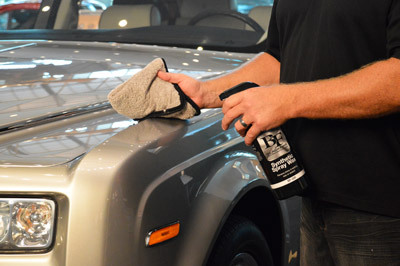 Transfer the spray wax into another bottle and you are good to go.